Sugar PR is proud to have been appointed to help promote a major new public relations campaign to encourage people in Liverpool, Chester and on the Wirral to sign up to environmentally-friendly glass bottle milk deliveries. 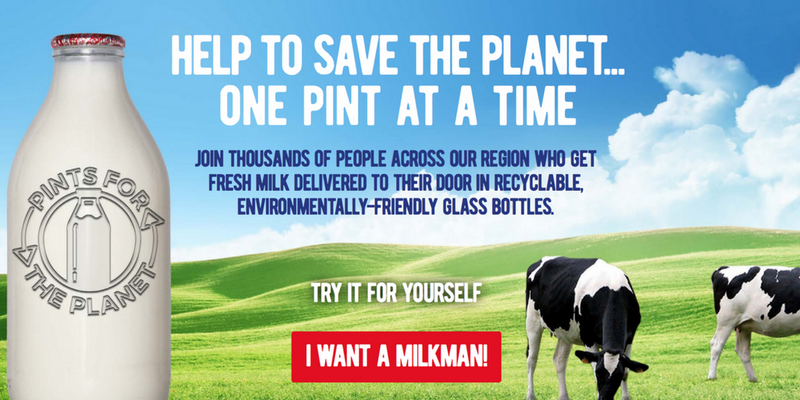 The amazing #PintsForThePlanet PR campaign has been launched by Mortons Dairies, the biggest dairy in the North West, and it draws attention to the environmental benefits of ordering milk that comes in pint-sized glass bottles. Mortons Dairies is headquartered in Maghull on Merseyside and has delivered milk in glass bottles for nearly 100 years. It has more than 140,000 glass bottles in circulation and delivers more than 27,000 pints of milk from seven depots on a fleet of around 100 electric milk floats daily. The family-owned business is now one of the North West’s largest dairies, with more than 50,000 customers and more 200 staff. Saving the planet…one pint at a time. The campaign was launched by the team on the BBC North West Tonight programme (you can watch the programme here) and featured staff, customers and milkmen from Mortons Dairies discussing the benefits of buying milk in glass bottles. We had a fun time working with the BBC and the Liverpool Echo to get the word out. There has been a significant uplift in orders from new customers since the beginning of the year, following the airing of Blue Planet II, which showed harrowing scenes of sea-life drowning in a sea of plastic. Our new Pints for the Planet campaign gives local people, particularly those who have never had a milkman before, the chance to try a free pint of our fresh milk in a bid to switch then from plastic to glass. Our glass bottles are environmentally-friendly and can be re-used up to thirty times. As well as the milk coming from local red tractor accredited farms in the region, we also make deliveries on our electric milk floats so the positive environmental impact is significant. We feel it is important to get the message out there through PR, social media, word-of-mouth and creative marketing campaigns. Our key message is that people can play a small but significant role in saving the planet….one pint at time. We are delighted to have been selected to communicate this positive campaign in the media to the wider public. The campaign has really captured the imagination of people as they seek to reduce the amount of plastic they consume. Mortons Dairies has an incredible reputation in the region and we are enjoying working with the team as we continue to drive awareness. The campaign is already evolving and we expect it to be a major talking point in the region as we roll it out in different ways. IF YOU LIVE IN LIVERPOOL, CHESTER OR ON THE WIRRAL – PLEASE SIGN UP FOR GLASS FRESH MILK BOTTLE DELIVERIES FROM YOUR LOCAL MILKMAN HERE.